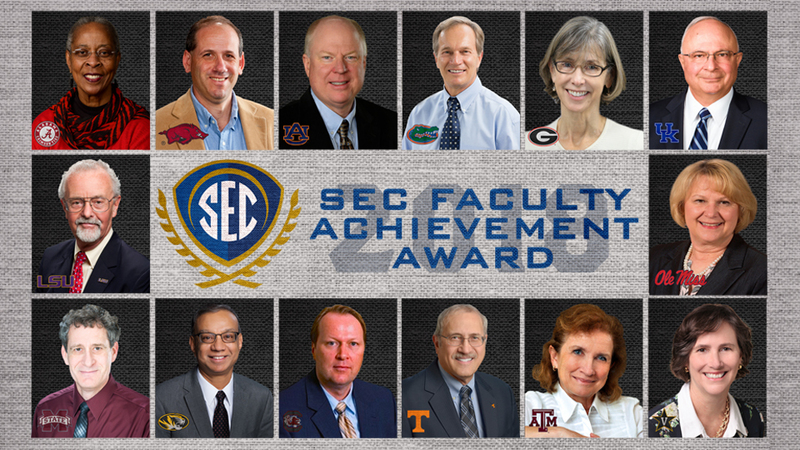 2018 SEC Faculty Achievement Award winners named from each SEC university. BIRMINGHAM, Ala. – Faculty members from each SEC university have been named recipients of the 2018 SEC Faculty Achievement Award, SEC Commissioner Greg Sankey announced Wednesday. The awards, now in their seventh year, honor one individual from each SEC university who has excelled in teaching and research. Each SEC Faculty Achievement Award winner will receive a $5,000 honorarium from the SEC and will become his or her university’s nominee for the SEC Professor of the Year Award. The SEC Professor of the Year, to be named in April, receives an additional $15,000 honorarium. The SEC Faculty Achievement Awards and the SEC Professor of the Year Award are both selected by the SEC Provosts, and they are two foundational programs designed by the SEC to support and promote the academic endeavors and achievements of its students, faculty and administrators. There are approximately 14,000 full-time, tenured faculty in the SEC, and below is a list of the 2018 SEC Faculty Achievement Award recipients.